The 3D Viewer can animate items and also record static or transient models to .AVI file. Rotate will allow you to rotate the model domain around the specified axis. If you wish to save to a video file, select the check box beside Write Video File and specify a name and directory. 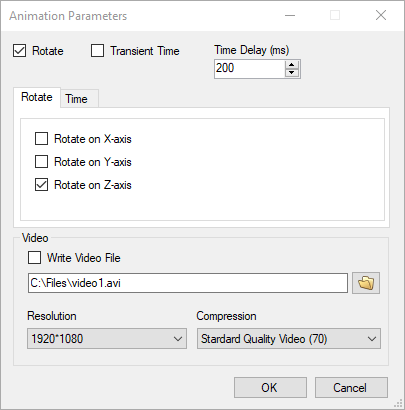 The combo box below this allows you to specify the video resolution. If you click on the Time tab, you will have options to specify the start and end time and the number of time frames. These options are only appropriate if you are animating Heads or Drawdown that has multiple output times. Click OK after defining the desired Animation settings. Then right-click on the 3D viewer and select Animate and the rotation will start. If you have selected to record a video file, then the video recording will begin. 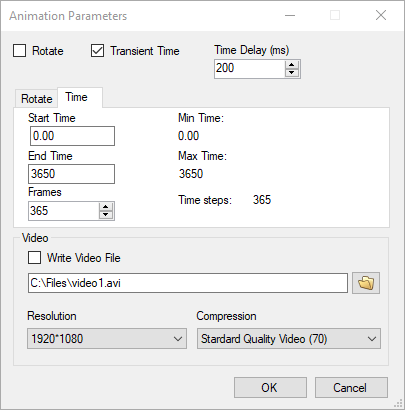 Once you are done recording, right click on the 3D viewer again and select Animate to stop the animation. The AVI recording can be memory and CPU intensive. The performance will depend on the size of the model you are visualizing and the hardware on your computer (memory, CPU, video driver).